I admit it – I’m a little behind on giving away books to folks who sign up on my email list. I have some paperback copies of Walking in the Dust of Rabbi Jesus that I’d be happy to send to some lucky winners. If you signed up a while ago and want to remind me of your interest in a free book, feel free to say so in the comments below. If you’re chosen, I’ll email you for your address. I enjoy your insights into the text. Please sign me up. Thanks. I am a bibliophile from way back and love to read, especially free books. Amy and I would love to have a copy of your book. Thanks for the opportunity! Lois, I always gain from your insights!! I signed up some time ago and I would love to receive your book. Your study of the scriptures result in wonderful insight to all your readers. Shalom. I can’t start to express how your website and articles helped me when I came to know of the Jewish roots of our faith. Would be lovely o receive that area article. Hope I will be amongst the lucky ones!!!! I stumbled on your website while searching for the word ‘hesed’ and found your post on that word which was so insightful and wonderful. Since then I have been reading every article and blogs I have time for. Thank you for your great website. It became part of my bible study routine and your book will be a great addition. Please keep me signed up for your book. I want to know all I can about my Jesus! 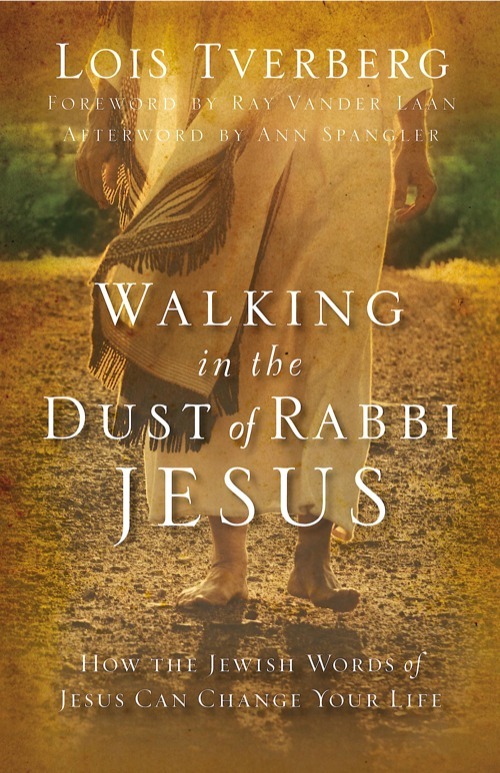 I loved Sitting at the Feet of Rabbi Jesus, so sign me up for a possible free copy of Walking in the Dust. I am a pastor and always want to learn more about Jesus and about the Bible. Lois, my husband and I have been drawn to our Hebraic roots for several years. Many of our church friends just “don’t understand” us. Walking in the Dust has been the perfect bridge, as you say! I have so many more who I would love to give your book to. PLEASE add me to your list for chance at a free book. It would be a blessing to have your book if there are still some available. Either way be blessed and your book be a blessing. I really have enjoyed your posts and have learned so much. Not sure if i’m commenting too late — would love to win a book. My husband & I just got from our first trip to Israel and were amazed by the things we learned & saw. I would be delighted to receive a copy of your book! I would love to get a copy of your book. I know it may be a bit much to ask but could you sign it? Thank you so much! I own one of your devotionals and I would love a free copy of another book! I love your writing style and I’m sure it’s just the thing I need in this busy season of my life as a college student. Hello i.m from Holland and I was looking on this syte, and hear that you give abook abouth how Jesus lived in hiss time, so I understand that there,s is no dutch translation of walking in the dust of rabbi Jesus, so I also like to read the original. Hi. I love your articles and blog. It my honour to read everything you put on the net. I am from Cape Town and would love a copy of your book. Never stop writing as so many of us just hang onto your writings. I have the book but would love a copy for our church library. I refer people to it a lot as an excellent introduction to the Jewish Jesus. Thanks for sharing your insight. I am in the process of researching my ancestors. Before my mother died she told me the family had Jewish roots. It did not really surprise me;I had for a long time been following Judaism. I should really like a chance of winning one of your books. I would very much like to receive your new book. I really benefit from your writings. Thank You for the opportunity. I would very much like to receive your new book. Hola, I read the book in spanish, its a great book. Brother John Ferret gave it to me (you might know him). It brought color to our understandig of discipleship, Thank you! If is not too late, I would like to get a copy in spanish for a friend of mine.